Give your phone a makeover with a personalised iPhone 6 case, UK made and printed. Choose your favourite photos, silly face or designs to create a wrap case. Our special imaging technique will give your personalised iPhone 6 cases a stunning finish, with the best quality printing in full colour. iPhone 6+ case also available. Top off your brilliant phone with a customised iPhone 6 case to match! Our personalised iPhone 6 phone cases are tough and durable and look great. Easy to design using our online design interface, simply choose photos or designs, which show off your personality and start creating a case, custom made just for you. So much better than generic phone cases from the shops, your iPhone 6 cases personalised with original photos can be designed to match your own personal style. If you're looking for a fun and unique gift idea for an iPhone 6 fanatic, then this is a perfect choice! I love my new phone cover. Photo has come out really well and once again, a great service from Bags of Love. Quick delivery. Excellent quality, made a great present! A very happy customer. excellent quality, very speedy delivery, both recipients very happy with there gifts. We pay a lot of care and attention to our products and hope that they make you happy for a very long time. To help with this, we offer a two-year guarantee with our UK iPhone 6 case. If it breaks, if the print comes off or if it fails at being fit for purpose, then we'll make you another one to replace it. 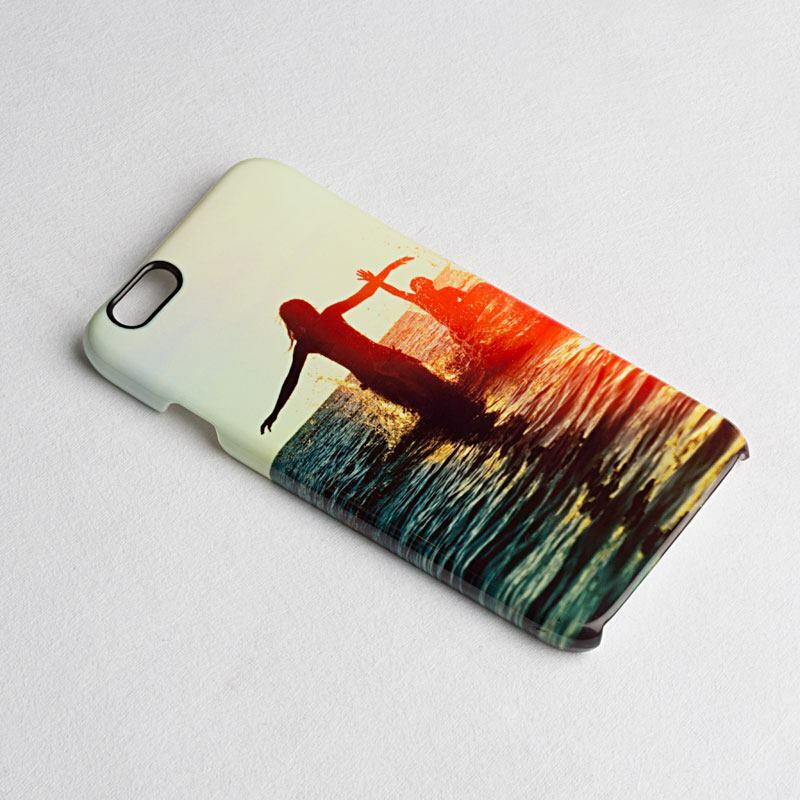 Like many of our products, your iPhone 6 case UK made and printed has a quantity discount. When you buy more, you save money per piece, so design one for all the family today and enjoy this discount. We use a specialist printing process that bonds the ink deep into the plastic fibres, creating a vibrant print that won't peel away or scratch off. The print is high definition, with details clear and colours vivid. Your photos or design wrap around the curved edges, resulting in a stylish 3D effect. Everything is made to order in London, UK, by our skilled technicians. We always advise bearing in mind where the camera cut out is as if any photo features are placed in this area they will be cut out to accommodate the camera. Use the design interface to edit and position your design accurately, ensuring all details are kept in the printable areas. If you're printing a portrait or headshot, this will be particularly important, especially where eyes and other facial features are concerned. Please note Your photos elegantly wrap around the edges, so pictures with a centred subject work really well. Alternatively, why not create a photo collage? You can choose all your favourite snaps and create a truly unique iPhone case personalised to perfection. If you have any sports fans in your family, iPhone 6 cases personalised with photos of their favourite players or a shot of them in action make for great gifts. You can also add some text to print their name, nickname or position that they play in their preferred sport. Create personalised iPhone cases for your friendship group, and match each other in a unique style. Gather all your best Instagram snaps together and make a gorgeous photo collage for the ultimate selfie showcase. When you text each other, no matter the subject, you'll be able to smile. For a professional touch, print your business card credentials onto personalised iPhone 6 cases, and make that important lasting impression. When you meet clients and customers, your professionalism is never compromised, extending all the way through to your accessories.